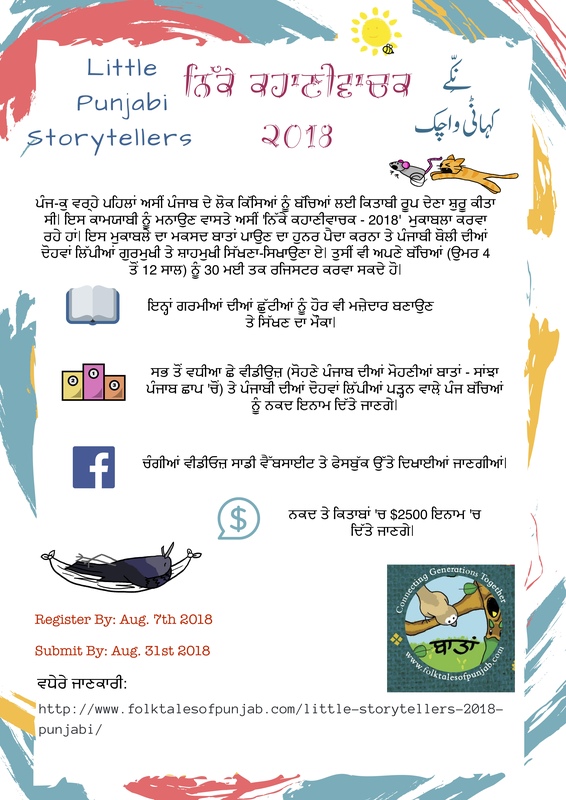 Fascinating Folktales of Punjab just turned five years old and we are celebrating with an online children’s Punjabi Folktales storytelling competition. We are giving away prizes worth $2500 in cash and books. Register your children (ages 1-12) in various categories and use summer time for learning and performance fun. 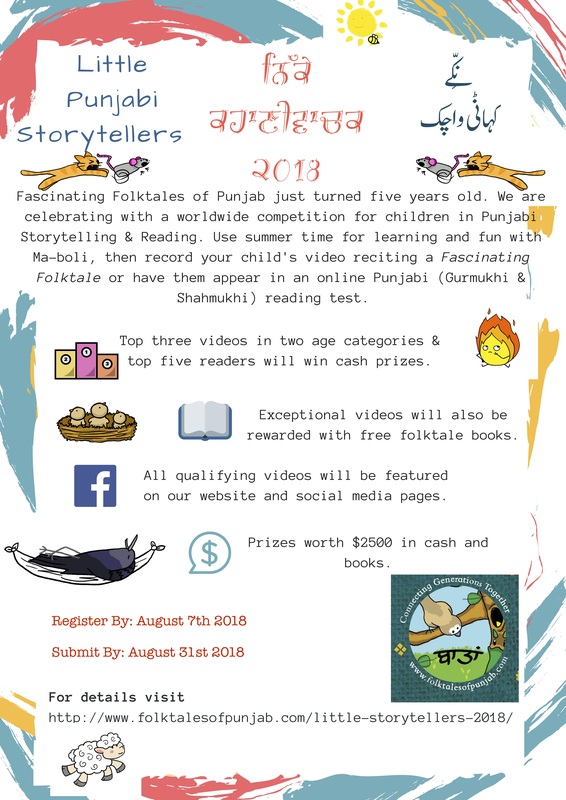 To enter, send high-quality video recordings of your child reciting one of the tales from Fascinating Folktales of Punjab (Undivided Punjab Edition) by August. The top three videos in two age categories will win cash prizes and all qualifying videos will be featured on our website and social media pages. Exceptional videos will also be rewarded with free folktale books. Or teach them the two scripts of the Punjabi language (Gurmukhi & Shahmukhi) and if they can read the folktales from the book in both the scripts in an online test they will be rewarded based on fluency. The top five candidates will win cash prizes and all qualifying candidates will have their test videos featured on our website and social media. Exceptional candidates will also be rewarded with free folktale books. Tests will be conducted in the month of September. Perform part of Tales 1, 2 or 3 from ‘The Undivided Punjab Edition’ or from the Fascinating Folktales of Punjab books 1-3. The top performances will be awarded books. Perform Tales 1, 2 or 3 from ‘The Undivided Punjab Edition’ or from the Fascinating Folktales of Punjab books 1-3. The top 3 performances will be awarded $200, $150 and $100 respectively. Perform Tales 4 or 5 from ‘The Undivided Punjab Edition’ or from the Fascinating Folktales of Punjab books 4-5. The top 3 performances will be awarded $300, $250 and $200 respectively. Read the folktales from ‘The Undivided Punjab Edition’ in both Gurmukhi and Shahmukhi. The top performances will be awarded $300, $250, $200, $150 and $100 respectively. Solo or groups including family can be involved in videos however main reading should be done by the child(ren). Only submissions with clear video and good sound quality will be eligible. Background music, props, lighting, costumes can be incorporated. The book must show in the video with some view of corresponding book pages. Judging criteria includes – presentation quality, expressions, voice, pronunciations and storytelling capability. Videos should be no more than 10 minutes long. Excited about this Folktalkes of Punjab initiative? Spread the word! Share with friends and family on Facebook and other social media. Download the printable posters from the links below. You can print them and put them up at your local schools, Gurughars and libraries.